Hyundai Motor has signed a memorandum with French energy firms to expand the sale of hydrogen fuel cell vehicles, the company said Wednesday. 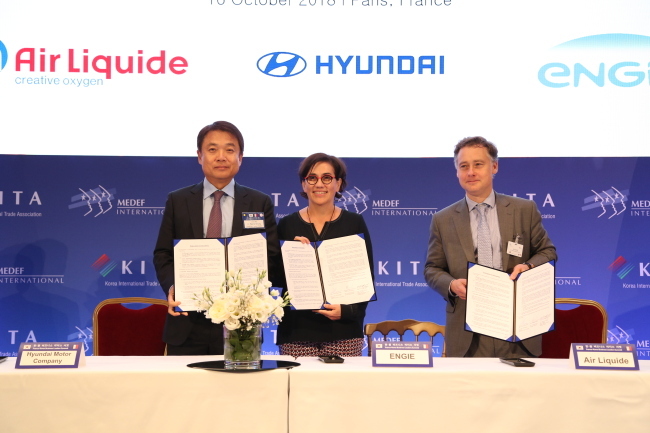 Under the agreement, the South Korean carmaker will partner with Air Liquide SA and Engie to promote the use of FCEVs and hydrogen refilling stations across France. The agreement came after Hyundai announced a plan to export 5,000 FCEVs to France by 2025. The leader in hydrogen-powered vehicles has been gearing up efforts to boost sales in Europe, where regulations for CO2 emissions are getting tougher. A FCEV is a zero emission car as it is powered by electricity converted from hydrogen and produces only water as a byproduct. Hyundai is the first carmaker to succeed in commercializing an FCEV. Nexo, its latest FCEV model, can travel up to 609 kilometers on a single charge. On Sunday, South Korean President Moon Jae-in showed up in downtown Paris to attend a test drive event of Nexo. The capital city of France has currently three Tucson FCEVs operating as taxis. The carmaker has exported around 100 Nexo FCEVs to government organizations, startups and research institutes in the US, Germany, Norway and the Netherlands since July. It also signed an initial agreement with a Swiss energy firm, H2 Energy, to provide 1,000 fuel cell electric trucks. By 2025, around 400 million passenger vehicles, 15-20 million trucks and 5 million buses powered by hydrogen will be released to the market, according to a recent report by McKinsey and Company.